Nuke & Pave + the “Cloud” = happiness! Sorry that it has been SO LONG since my last decent post. I went through the Microsoft Certified Master’s program for Directory Services, so my six thousand pages of pre-reading and labs just put me a bit behind. I have eight articles queued up for editing, but my inbox still hasn’t recovered fully so… It might be a bit. Still, that has NOTHING to do with this post. I decided to bypass my current “blog” queue and talk about something that has me pretty excited. I’m totally in the cloud. I mean, completely! I realized this the other night when I decided I wanted to reload my primary laptop (always an incredibly painful experience). I have a project coming up that will require some overseas travel, and I wanted the Windows 8 client version of Hyper-V to take my VM’s with me. I spend 30 minutes trying to find the “pain” and I just couldn’t. I had a list of about a half dozen post-deployment tasks (re-adding printers, installing the Sprint SmartView app, etc) but… I was having a hell of a time figuring out what I actually needed to save off. The answer? I didn’t realize at the time but – I just don’t have much of anything that will be lost anymore when I nuke/pave (wipe and reload) a computer. 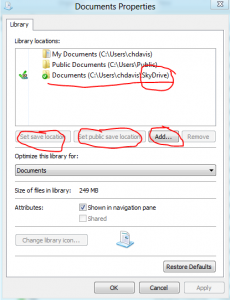 As you can see from the screenshot above, I have added the skydrive folder to the library. 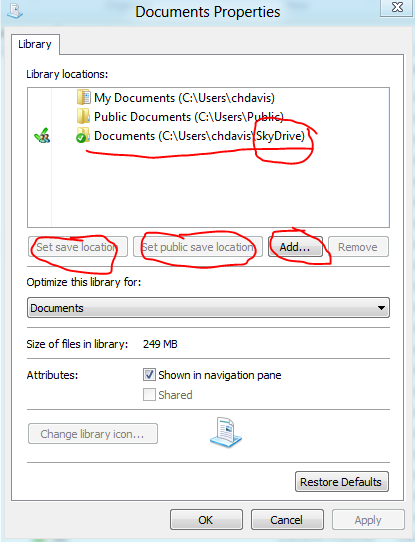 I then made it the default save location (if you’re running Windows 8 you can also set the public save location). This means all NEW documents will be added to this folder. 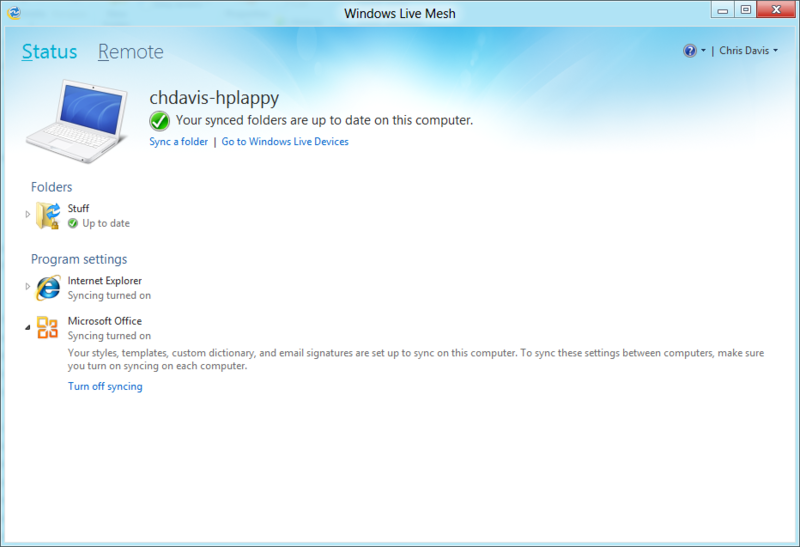 Finally – I simply moved all of my documents from my local “Documents” folder (c:\users\chdavis\documents in my case) into the skydrive folder (C:\Users\chdavis\SkyDrive\Documents). This has the effect of making the documents all show up just like they did before when I go into documents, but, it also means they exist both on my laptop AND in the cloud at the same time. Meaning if I ever lose the hard drive on my laptop, I don’t lose that folder. All I have to do is re-install the Skydrive app. So, next step was to rinse/repeat for my other libraries (pictures, music, videos, self-created libraries, etc) so they all “live” in the cloud. Now here is where it get’s really awesome. I, like a lot of people do, carry around multiple devices. For instance, my Tablet (also running Windows 8). Now that the documents live in the cloud – all I had to do was set the same thing up on it in the same way, and “Bing!”, it has the same mirrored library. As you can see here, my IE Favorites are sync’d. So is office. Also, in my case, a folder on my desktop called “stuff” that I wanted to “live” both on my computer and my tablet. The rest of my desktop I just use for really large temporary project files so I don’t burn up cloud space. Now all my important stuff lives on all my devices – in fact, because I’m a Windows Phone user… guess what? 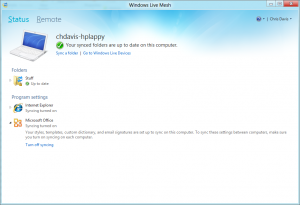 There’s a SkyDrive app for that too! (yeah yeah, there’s one for you Apple phone users also). Meaning I can get my documents on the go. So there it was. I’m sitting there ready to reload my laptop to Windows 8. I’m scratching my head trying to figure out why it isn’t hurting. Finally I just take the leap. The end result? 1 hour and 20 minutes later I’m done. I let it “cook” overnight (download all the files, I consume about 7GB in the cloud so it needed a little time to catch up). Posted on May 10, 2012 April 2, 2015 Leave a comment on Nuke & Pave + the “Cloud” = happiness!